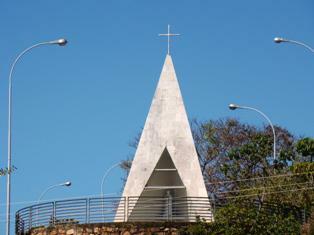 This small pyramid-shaped chapel lies exactly on parallel 15, on the shores of Paranoa lake. Designed by Niemeyer, it was inaugurated in 1957, to remember Italian Priest Dom Bosco, who in 1883 had a visionary dream about the construction of a city between parallels 15 and 20, where Brasilia is currently located. The sanctuary is surrounded by a garden and houses a Carrara marble statue of the priest, designed by Arreghini di Pietra Santa brothers in 1957. With a view of Paranoa lake and the city, Ermida is part of a ecological preservation area, offering visitors walking and biking trails and beautiful sunset views due to its high location. Opened daily, from 7am to 7pm.